Prepared by Harry Beran, last updated 18 March 2004. With a few entries added later. At present the bibliography does not include literature on specific culture areas (such as Papuan Gulf, Maori or Kiribati). For references on specific culture areas see the bibliographies in D’Alleva (1998), Fraser (1996), Guiart (1963), and esp. Kaeppler, Kaufmann & Newton (1997). Items are listed under one heading only. E.g. books on New Guinea art only are listed under heading 10 and are not included under any of the previous headings. 12. Items uncatalogued because I don’t know or remember content well enough. Thomas, Nicholas. 1995. Oceanic Art. London: Thames & Hudson. Bühler, Alfred, Barrow, Terry & Mountford, Charles P. 1961. Oceanian und Australien: Die Kunst der Südsee. Zürich. English edition: 1968. The Art of the South Sea Islands Including Australia and New Zealand. New York: Greystone. Gathercole, Peter, Kaeppler, Adrienne L. & Newton, Douglas. 1979. The Art of the Pacific Islands. Washington: National Gallery of Art. Guiart, Jean. 1963. The Arts of the South Pacific. London: Thames & Hudson. Meyer, Anthony JP. 1995. Oceanic Art. 2 vols. Köln: Könemann. Schmitz, Carl A. 1969. Oceanic Art. Myth: Man and Image in the South Seas. New York. Burt, Eugene C. 1988. Ethnoart: Africa, Oceania, and the Americas. A Bibliography of Theses and Dissertations, New York and London: Garland Publishing, Garland Reference Library of the Humanities, vol. 840, 191 pp., indexes. An Ethnographic Bibliography of New Guinea. 1968. Canberra: Australian National University. Bibliography of New Guinea Peoples. N.d. (c. 1967). Prepared for the New Guinea Encyclopaedia (Trobriands and Tolai omitted). [A renoed typewriter-written copy in Fisher Library, University of Sydney, 572.99. I don’t know whether all the inormation was incorporated int the Encyclopaedia of Papua and New Guinea (1972). Anderson, Richard L. 1979. Art in Primitive Societies. Englewood-Cliffs, New Jersey: Prentice-Hall. Ch. 1. Leach, E.R. 1961. ‘Aesthetics’ in The Institutions of Primitive Society edited by E.E. Evans-Pritchard et al. Glencoe, Ill.: The Free Press. pp. 25-38. Schwimmer, Eric. 1990. ‘The anthropology of the Ritual Arts’ in Hanson and Hanson (1990), ch. 2. Anderson, Richard L. 1979. Art in Primitive Societies. Englewood-Cliffs, New Jersey: Prentice-Hall. Ch. 2. The Alan Wurtzburger Collection of Oceanic Art. 1956. Baltimore: Baltimore Museum of Art. Ambesi, Alberto. 1970. Oceanic Art. London: Hamlyn. Appel, Michaela. 2005. Oceania: Wold Views of the South Seas. München: Staatliches Museum für Völkerkunde. Arte Dell’Oceania. 1971. Rome: Museo Preistorico Etnografico ‘L. Pigorini’. Barton, Gerry and Dietrich, Stefan. 2009. This Ingenious and Singular Apparatus: Fishing Kites of the Indo-Pacific. Publihsed on demand in Association with the Portheim Foundation, Heidelberg, Germany. Beran, Harry and Craig, Barry (eds). 2005. Shields of Melanesia. Adelaide: Crawford House Publishing and Honolulu: University Press of Hawaii. Bounoure, Vincent. 1992. Vision d’Oceanie. Paris: Musée Dapper. Brake, Brian, MacNeish, James & Simmons, David. 1979. Art of the Pacific. Wellington: Oxford University Press. Bühler, Alfred & Gabus, J. 1970. Art Océanien. Exposition Musée d’Ethnographie de Neuchatel. Cochrane, Susan. Forthcoming. Bérétara: Contemporary Pacific Art. Noumea: Tjibaou Cultural Centre and Syndey: Halstead Press. Duff, R. & Park, S. 1975. The Art of Oceania. Paris: Unesco. Edmundson, Anna & Boylan, Chris. 1999. Adorned: Traditional Jewellery and Body Decoration from Australia and the Pacific. Sydney: The University of Sydney. Dritte Abth. Mikronesien: I. Gilbert Inseln. 1893, Vol. VIII: 1  – 106 , Plates ??? Dritte Abth. (cont. ): Mikronesien: II. Marshall-Archipel; III. Carolinen. 1893, Vol. VIII: 119  – 275 , Plates ???? Dritte Abth. (cont. ): Mikronesien: Schluss – Kuk und Mortlock. 1893, Vol. VIII: 295  – 437 , Plates ??? Fischer, Hans. 1958. Schallgeräte in Ozeanien. ???? Force, Roland & Force, Maryanne. 1971. The Fuller Collection of Pacific Artefacts. London. Heermann, Ingrid & Mentor, Ulrich. 1990. Schmuck der Südsee: Ornament und Symbol. München: Prestel. Honolulu Academy of Arts. 1967. An Exhibition of Oceanic Arts from Collections in Hawaii. Hunt, Charles. N.d. Shark Tooth & Stone Blade. Aberdeen: University of Aberdeen. Idiens, Dale. 1982. Pacific Art in the Royal Scottish Museums. Edinburgh. Kaeppler, Adrienne. 1978. “Artificial Curiosities” being an Exposition of Native Manufactures Collected on the Three Pacific Voyages of Captain James Cook, R.N. Bernice P. Bishop Museum Special Publication 65. Honolulu: Bishop Museum Press. Kaufmann, Christian. 1980. Ozeanische Kunst: Meisterwerke aus dem Museum für Völkerkunde, Basel. Basel: Museum für Völkerkunde. Linton, Ralph & Wingert, Paul. 1946. Arts of the South Seas. New York. Neich, R. & Pendergrast, M. 1997. Traditional Tapa Textiles of the Pacific. London: Thames & Hudson. Nevermann, H. 1933. Südseekunst. Berlin: Stattliches Museum für Völkerkunde. Newton, Douglas & Finn, David. 1978. Oceanic Images. New York: Harry N. Abrams. Ozeanien Australien. 1967. Vienna: Museum für Völkerkunde. Parkinson, Richard. 1999. Thirty Years in the South Seas. Bathurst: Crawford House Publishing in association with Oceania Publications, University of Sydney. Translation by John Dennison of Dreißig Jahre in der Südsee, 1907. Poncetton, F. & Portier A. 1930. Les Arts Savages: Océanie. Paris: Albert Morancé. Powell, Jane P. & Friedman, Martin L. 1957. Primitive Art of the Pacific Islands. New York: Brooklyn Museum. Price, Christine. 1979. Made in the South Pacific. London: The Bodley Head. Saulnier, Bonny B. N.d. The Helen S. Slosberg Collection of Oceanic Art. RoseArt Museum, Brandeis University. Saulo, Johnny. 1988. Inventory of garamuts from Sepik-Ramu made before 1960 held in villages & institutions in Papua New Guinea. First draft. (typescript). Boroko: National Museum. Schmalenbach, W. 1956. Plastik der Südsee. Stuttgart: H.E. Günther. Smidt, Dirk, Keurs, Pieter ter, Trouwhorst, Albert (eds). Pacific Material Culture: Essays in honour of Dr. Simon Kooijman on the occasion of his 80th birthday. Leiden: Rijksmuseum voor Volkenkunde. [Articles on Oceanic bark cloth and New Guinea carvings. Speiser, Felix. 1941. Kunststile in der Südsee. Basel: Museum für Völkerkunde. (Exhibition guide.) English translation in The Many Faces of Primitive Art: A Critical Anthology, edited by D. Fraser. Englewood Cliffs, N.J.: Prentice-Hall, 1966. Spriggs, Mathew (ed.) 1990. Lapita Design, Form and Composition: Proceedings of the Lapita Design Workshop, Canberra, December 1988. Tiesler, Frank. 1992. Malerei Grafik aus Ozeanien. Eine Ausstellung des Staatlichen Museums für Völkerkunde Dresden im Japanischen Palais. Dresden: Staatliches Museum für Völkerkunde. Tischner, H. 1954. Oceanic Art. London: Thames & Hudson and New York: Pantheon Books. Wardwell, A. 1994. Island Ancestors: Oceanic Art from the Masco Collection. Seattle: University of Washington Press. Welsch, Robert L. (ed.) 1999. Proceedings of a Special Session of the Pacific Arts Association. Festschrift to Honour Dr. Philip J.C. Dark. Working Papers. Pacific Arts Association. Were, Graeme. 2010. Lines that Connect: Rethinking Pattern and Mind in the Pacific. Wingert, Paul S. 1953. Art of the South Pacific Islands. New York. Wingert, Paul. 1970. Oceanic Art, with a supplement An Outline of Oceanic Art. Cambridge, Mass. : The University Prints. Abbate, Francesco. 1972. African Art and Oceanic Art. London: Octopus Books. Anderson, Richard L. 1989. Art in Small-Scale Societies, 2nd edn. Englewood Cliffs, N.J.: Prentice-Hall. Earlier edition (1979) edition published as Art in Primitive Societies. Anderson, Richard L. & Field, Karen L. (eds). Art in Small-scale Societies: Contemporary Readings. Englewood Cliffs, N.J.: Prentice-Hall. Attenborough, David. 1976. The Tribal Eye. London: British Broadcasting Corporation. — 1981. Tribal Encounters: An exhibition of ethnic objects collected by David Attenborough. Leicester: Leicestershire Museums, Art Galleries and Records Service. Barbier, Jean-Paul. 1977. Arts d’Afrique, d’Océanie, et d’Amérique. Geneva. Benitez-Johannet, P. & Barbier, Jean Paul. 2000. Shields: Africa, Southeast Asia and Oceania. Munich: Prestel. Bossert, H.&. 1990. Folk Art of Asia, Africa, Australia and the Americas. New York: Rizzoli. [Includes some Oceanic designs. – Is this a reprint of the 1955 book? Christensen, Erwin O. 1955. Primitive Art. New York. Clifford, James. 1988. The Predicament of Culture: Twentieth-Century Ethnography, Literature, and Art. Cambridge, Mass. : Harvard University Press. Corbey, Raymond. 2000. Tribal Art Traffic: A Chronicle of Taste, Trade and Desire in Colonial and Post-Colonial Times. Amsterdam: Royal Tropical Institute – The Netherlands. Duly, Colin. 1979. The Houses of Mankind. London: Thames & Hudson. Dwyer, J.P. & Dwyer, E.B. 1973. Traditional Art of Africa, Oceania and the Americas. San Francisco. Feest, Christian. 1980. The Art of War. London: Thames & Hudson. Geoffroy-Schneiter, Berenice. 2000. Primal Arts: Africa, Oceania and the Southeast Asian Islands. Translated by Barbara Mellor from the French edition Arts Premiers. London: Thames & Hudson. 400 pp. Greenberg, Mark. D. (ed.) The Brooklyn Museum: Masterpieces in the Brooklyn Museum. New York: The Brooklyn Museum in association with Harry N. Abrams. Greub, Suzanne (ed.) 1988. Expressions of Belief: Masterpieces of African, Oceanic, and Indonesian Art from the Museum voor Volkenkunde, Rotterdam. New York: Rizzoli. Haddon, A.C. 1895. Evolution in Art. London: Walter Scott. Heuvel, G. van den & Kooten, T. van. 1990. Sculptures from Africa and Oceania. Otterlo: Reichsmuseum Kröller-Müller. Hooper, J.T. & Burland, C.A. 1953. The Art of Primitive Peoples. London: Fountain Press. Joppien, R. & Smith B. 1985-1988. The Art of Captain Cook’s Voyages. 3 (actually 4) vols. New Heaven. Koch, Gerd. 1984. Boote aus aller Welt. Berlin: Museum für Völkerkunde. and the Americas. Paris: Flammerion and Musée du quai Branley. Leurguin, Anne. 2003. A World of Necklaces Africa, Asia, Oceania, America from the Ghysels Collection. Milan: Skira. Newton, Douglas. 1978. Masterpieces of Primitive Art: The Nelson A. Rockefeller Collection. New York: Alfred A. Knopf. Pelrine, Diane M. 1996. Affinities of Form: Arts of Africa, Oceania, and the Americas from the Raymond and Laura Wielgus Collection. Munich: Prestel. Phelps, S. 1976. Art and Artefacts of the Pacific, Africa and the Americas: The James Hooper Collection. London: Hutchinson. Quiggin, A.H. 1949. A Survey of Primitive Money. London: Methuen. Sydow, Eckart von. 1921. Exotische Kunst, Afrika und Ozeanien. Leipzig. Trowell, M. & Nevermann, H. N.d. African and Oceanic Art. Translated from the German. New York: Harry N. Abrams. Wayne Long Ethnic Art Collection. 1970. Los Angeles: Otis Art Institute. [48 pp., 84 ills mainly Africa & Oceanic objects. Wingert, P.S. 1962. Primitive Art: Its Traditions and Styles. New York: Oxford University Press. Archey, Gilbert. 1965. The Art Forms of Polynesia. Auckland: Auckland Museum. Barrow. T. 1971. Art and Life in Polynesia. London: Pall Mall Press. Damm, Hans. 1959. Polynesien. Die Schatzkammer, Vol. 1. Leipzig: Prisma Verlag. Dodd, Edward. 1967. Polynesian Art. New York: Dodd, Mean & Company. Duff, Roger. 1969. No Sort of Iron: [The?] Culture of Cook’s Polynesians. ???? : Art Galleries & Museums’ Association of New Zealand. [Exhibition catalogue. Joost Daalder has copy. Gell, A. 1993. Wrapping in Images: Tattooing in Polynesia. Oxford: Clarendon Press. Greiner, Ruth. 1923. Polynesian Decorative Designs. Honolulu: Bishop Museum Press. Kaeppler, Adrienne. Forthcoming. Polynesian and Micronesian Art. Oxford University Press. Oxford History of Art. Kaeppler, Adrienne. 2010. Polynesia: The Mark and Carolyn Blackburn Collection. Kooijman, Simon. 1973. Tapa techniques and patterns in Polynesia: a regional differentiation. (Primitive art and society). London: Oxford University Press. Linton, R. 1926. Ethnology of Polynesia and Micronesia. Chicago. Oldman, O. 1943. The Oldman Collection of Polynesian Artefacts. Wellington. Alkire, W.H. 1977. An Introduction to the Peoples and Cultures of Micronesia. Menlo Park: Cummings Publishing Co.
Morgan, W.N. 1988. Prehistoric Architecture of Micronesia. Austin: University of Texas Press. Wavell, Barbara. ?2010 or 2011. Arts and Crafts of Micronesia: Trading with Tradition. Honolulu: Bess Press. Weiss, Gabriele & Petrosian-Husa, Carmen. 1996. Strahlende Südsee: Inselwelt Mikronesien. Vienna: Museum für Völkerkunde Wien. Barbier, Jean-Paul. 1977. Indonésie et Mélanésie. Geneva. Beran, Harry & Craig, Barry. forthcoming. War Shields New Guinea New Britain Solomon Islands. Bathurst: Crawford House Publishing in association with Oceanic Art Society. Cranstone, B.A.L. 1961. Melanesia: A Short Ethnography. London: The British Museum. Conru, Kevin. 1999. The Colour of Melanesia. London & Brussels: Kevin Conru Primitive Art. Heraldic Shields. 1981. Exhibition selected and prepared by Eric Rowlison and Judith Ryan with a poster catalogue. November 1981 – January 1982. Victorian Ministry of the Arts. Melanesian Art. 1967. Catalogue of exhibition at University of California, at Irvine & Davis. Introduction by William Davemport. Moore, David. R. 1968. Melanesian Art in the Australian Museum. Sydney: The Trustees of the Australian Museum. Museo di Antropologia e Etnologia di Firenze. 1922. Oceania Nera: Arte, cultura e populi della Melanesia nelle collezioni del Museo di Antropologia e Etnologia di Firenze. Florence: Cantini. O’Hanlon, Michael. Forthcoming. Melanesian Art. Oxford University Press. Oxford History of Art. Santa, Elizabeth della. 1957? Arts de la Melanesie. Brussels: Musées royaux d’art et d’histoire. Sieber, Roy, Newton, Douglas & Coe, Michael D. ???? African, Pacific and Pre- Columbian Art in the Indiana University Art Museum. Indianapolis. Schmitz, Carl August. 1962. Oceanic Sculpture: Sculpture of Melanesia. New York: New York Graphic Society. Stöhr, Waldemar. 1971. Melanesien: Schwarze Inseln der Südsee. Köln: Rautenstrauch-Joest-Museum für Völkerkunde der Stadt Köln. — 1987. Kunst und Kultur aus der Südsee: Sammlung Clausmeyer, Melanesien. Köln: Rautenstrauch-Joest-Museum für Völkerkunde. Tavarelli, Andre (ed.) 1995. Protection, Power and Display: Shields of Island Southeast Asia and Melanesia. Boston: Boston College of Art. Wingert, Paul S. 1952. Human Forms in the Art of Melanesia. Handbook of the Auckland Institute and Museum. Art of New Guinea: Sepik, Maprik and Highlands. 1967. Los Angeles: The Ethnic Art Galleries University of California Los Angeles. Cochrane, S. 1997. Contemporary Art in Papua New Guinea. Sydney: Craftsman House. Cranstone, B.A.L. ‘Material Culture’ in Encyclopaedia of Papua & New Guinea. Melbourne: Melbourne University Press in association with the University of Papua and New Guinea. Egloff, B. (ed.) 1977. Pottery of Papua New Guinea. The National Collection. Port Moresby: Papua New Guinea National Museum and Art Gallery. Fuhrmann, Ernst. 1999. New Guinea: People and Art. Transl. from the German by Walter E.J. Tips. Bangkok: White Lotus Co. Original German edition pub. 1922 as Neu Guinea, Hagen i. W.: Folkwang Verlag. Guide to the Collections. 1974. Papua New Guinea Public Museum and Art Gallery. Haddon, A.C. 1894. The Decorative Art of British New Guinea. Dublin: Academy House. Hannemann, E.F. 1969. Grassroots Art of New Guinea. Sydney: Pacific Publications. Kaufmann, Christian. 1975. Papua Niugini: Ein Inselstaat im Werden. Basel: Museum für Völkerkunde. Kooijman, Simon. 1955. De kunst van Nieuw Guinea, ‘s-Gravenhage: Servire. Mackenzie, Maureen. 1992. Androgynous Objects: String bags and gender in central New Guinea. Chur, Switzerland: Harwood Academic Publishers. Neuhauss, R. (ed.) 1911. Deutsch Neu-Guinea. Vols I – III. Berlin. Newton, Douglas. 1972. ‘Art’ in Encyclopaedia of Papua & New Guinea. Melbourne: Melbourne University Press in association with the University of Papua and New Guinea. Reif, Rita 1991. “Haunting Symbols Mark the Bones of New Guinea’. Review of exhibition curated by Douglas Newton of small bone objects at the Metropolitan Museum of Art, New York. The New York Times, Sudnau, January 20. Simons, S.C. & Stevenson, H. (eds). 1990. Luk Luk Gen! Look Again! Contemporary Art from Papua New Guinea. Townsville: Perc Tucker Regional Gallery. Smidt, Dirk. 1975. The Seized Collections of the Papua New Guinea Museum. Waigani: Creative Arts Centre. Vrgyas, Gabor. 2004. ‘A Short History of the Pacific Collections of the Ethnographic Museum, Budapest’. Paper presented to the ECHO Workshop Budapest 2004. Previously published in Pacific Arts, Nr 5, 1992, pp. 24-32. Bolton, L.M. 1980. Oceanic Cultural Property in Australia. Sydney: UNESCO. Bolton, L.M. & Specht, Jim. 1984-1985. Polynesian and Micronesian Artefacts in Australia: an Inventory of Major Public Collections, 3 vols. Gathercole, Peter & Clarke, Alison 1985. Survey of Oceanic Collections in Museums in the United Kingdom and the Irish Republic. Paris: UNESCO. Hunter, J.E. 1968. Inventory of Ethnological Collections in Museums of the United States and Canada. 2nd edn, revised and enlarged. Committee on Anthropological Research in Museums of the American Anthropological Association and the Wenner-Genn Foundation. Kaeppler, Adrienne & Stillman, Amy Ku’uleialoha. 1985. Pacific Island and Australian Aboriginal Artefacts in Public Collections in the United States of America and Canada. Paris: UNESCO. Kaufmann, C 1990. ‘Swiss and German Ethnographic Collections as Source Materials: A Report on Work in Progress’, in Sepik Heritage: Tradition and Change in Papua New Guinea. Edited by Nancy Lutkehaus et al. Durham, N.C.: Carolina Academic Press, pp. 587-595. Lavondés, Anne. 1986. ‘Les collections ethnographiques, polynésiennes dans les musées francais.’ Nouvelle des musées classés et contrôlés 10: 5-2. Neich, Roger. 1982. Pacific Cultural Material in New Zealand Museums. New Zealand National Commission for UNESCO. Schumann, Yvonne. 1986. Museum Ethnographers’ Group Survey of Ethnographic Collections in the United Kingdom, Eire and the Channel Islands. Liverpool: Museum Ethnographers’ Group. Simmons, David R. 1982. ‘Catalogue of Maori Artefacts in the Museums of Canada and the United States of America.’ Auckland Institute and Museum Bulletin 12. Force, R.W. & Force, M. 1968. Art and Artefacts of the 18th Century: Objects in the Leverian Museum as Painted by Sarah Stone. Honolulu: Bishop Museum Press. Linden Museum, Stuttgart. 1973. Bilder der Menschen in Fremden Kulturen. Eine Ausstellung des Linden Museums Stuttgart. McLeod, Malcolm & Mack, John ???? Ethnic Sculpture. London: British Museum. Ratzel, Friedrich. 1886. Völkerkunde, 2. Band. Leipzig. To complement the bibliography on the web site of the Centre for Cross-Cultural Research, this bibliography is published in list form. Makes it possible to locate items that would not come up under subject index unless extremely well constructed) E.g. New Guinea art: New Guinea, Papua, Papua New Guinea in a number of different languages – check what does come up. – check vols II & III if possible. – Art or Arts? PAA symposium or did society not yet exist? – Is the 2nd publisher correct? – Shift from Polynesian to Oceanic art? Moyle, Richard M. 1989. The Sounds of Oceania. An Illustrated Catalogue of the Sound Producing Instruments of Oceania in the Auckland Institute and Museum. Auckland: Auckland Institute and Museum. Neich, Roger and Pereira, Fuli. 2004. Pacific Jewellery and Adornment. Auckland: David Bateman and Auckland War memorial Museum. Papua New Guinea: <http://coombs.anu.edu.au/~marck/anhmpg.htm> NB: DELETE, THIS WEB SITE ADDRESS IS EITHER INCORRECT OR DOESN’T EXIST ANYMORE. ‘unknown to Greenway’ is remark in Serendipity catalogue – so Greenway must be a biblio of ??? Allied Geographical Section, Southwest Pacific Area. An annotated bibliography of the Southwest Pacific and adjacanetareas, 4 Vols, ?1940s. Facsimile edn Broadbeach Waters, Qld: Pacific Books, 1990. – Vol. 4: (Supplement to the previous volumes) . Leeson, Ida. 1954. A Bibliography of Bibliographies of the South Pacific. Oxford U.P. Bernatzig, H.A. 1935. SÜDSEE: Travels in the South Seas. London: Constable. Kaufmann, Christian. Ozeanien (Oceania). 1979. Basel: Museum für Völkerkunde. [48 pp, text in German, French, and English.]. Kirch, Vinton. 1997. The Lapita Peoples: Ancestors of the Oceanic World. ? : Allen & Unwin. Mellen, Francisco and Zamarron, Carmen. 1993. Catalogo de Armas y Artefactos de las Islas del Oceano Pacifico Central y Australia del Museo Naval de Madrid. Madrid: Ministerio de Defensa Armada Espanola Instituto de Historia y Cultura Naval Museo Naval. Menter, Ulrich (edited by Rainer Springhorn). 2003. Ozeanien: Kult und Visionen. Verborgene Schätze aus Deutschen Völkermuseen. München: Prestel. Powell, Jane P. & Friedman, Martin L. 1957. Primitive Art of the Pacific Islands. New York: Brooklyn Museum. Vouyage Autour du Masque: Masques d’Océanie. 1985. Musée International du Carnaval et du Masque de Binchi. [Exhibition catalogue.]. Borel, France. 1994. The Splendour of Ethnic Jewellery. From the Colette and Jean- Pierre Ghysel Collection. London: Thames & Hudson. Mellen, Francisco and Zamarron, Carmen. 1993. Catalogo de Armas Y Artefactos de las Islas del Oceano Pacifico Y Australia del Museo de Madrid. Madrid. 94 pp, 51 b/w + 9 colours ills. Opitz, Charles, J. 2000. An Ethnographic Study of Traditional Money. Ocala. 411 pp, c. 400 illustrations. Read, C.H. 1910. Handbook to the Ethnographical Collections of the British Museum. ????? Museo de Etnologia. 1988. Artefactos Melanesios. Exposicao. Lisbon. Reichard, G.A. 1933. Melanesian Design: A study of Style in Wood and Turtleshell. 2 vols. New York. Chenoweth, Vida. 1976. Mussical Instruments of Papua New Guinea. Ukarumpa: Summer Institue of Linguistics. Kaufmann, Christian et al. 1979. Völkerkundliche Sammlungen in der Schweitz, I. Übersichtsinventare der Museen in Basel, Bern, Geneve, Neuchatel und Zürich. Ethnologica Helvetica 2-3 Bern. Specht, J. and Bolton, L. 2005. ‘Pacific Islands artefact collections: the Unesco inventory.’ Journal of Museum Ethnography. 17: 58-74. Bourgoin, P., Chabod, J., Dawance, F. 2004. Tribal Art in Europe. Paris: Art Tribal and Geneve: Editions D.
Quanchi, Max & Robson, John. 2005. Historical Dictionary of the Discovery and Exploration of the Pacific Islands. ? ?Scarecrow Press. Quanchi, Max. 2002. Jacaranda Atlas of the Pacific Islands. ?Brisbane: Jacaranda Press. Scheps, Birgit & Liedtke, Wolfgang. 1992. Bibliography of German colonial literature for references of Ethnology and History of the population of Kaiser Wilhelm Land, the Bismarck Archipelagoand the Solomon Islands 1880-1914, annotated. Dresden: Staatliches Museum für Völkerkunde Dresden. Appadurai, Arjun (ed.) 1988. The social life of things: Commodities in cultural perspective. Cambridge: Cambridge University Press. Bolzan, Ric. 1991. ‘Frank Hurley Collection.’ Australian National History 23 (8) : 650-3. Coote, Jeremy & Shelton, Anthony (eds). ???? Anthropology, Arts and Aesthetics. ???? Delougaz, P. 1974. The U.C.L.A. Museum of Cultural History: A Decade in Retrospect. Ellis, W. 1830 (1829). Polynesian Researches During a Residence of Nearly Six Years in the South Sea Islands . . . 2 Vols. London: Fisher, Son & Jackson. [1100 pp., 7 plates, 16 engravings. Considered first source of significant information abt Polynesia. Relevant? Errington, Shelly. 1998. The Death of Authentic Primitive Art and Other Tales of Progress. Berkeley, Cal. : University of California Press. Forge, Anthony (ed.) 1972. Primitive Art and Society. London. Hatcher, E.P. 1985. Art as Culture: An Introduction to the Anthropology of Art. Lanham. [286 pp., 189 drawings. Uses theories of anthropology to illuminate tribal art.] – anything Oceanic? Jones, D.L. (author), Hatton A.G. (curator). ????. The Pacific, Australia and the Americas: a guide to the Ipswitch Collections. Ipswitch: Ipswitch Museum. Linton, R. 1955. The Tree of Culture. New York. [692 pp., 134 ills. -Anything on Oceanic art? Lommel, A. 1966. Prehistoric and Primitve Man. New York. [176 pp., 105 ills. Has a few pp on Oceanic art.] 1967 German edition titled Vorgeschichtliche and Naturvölker. Guterlson. Thomas, Nicholas. 1991. Entangled Objects: Exchange, Material Culture, and Colonialism in the Pacific. Cambridge, Mass. : Harvard University Press. — Possessions: Indigenous Art/Colonial Culture. London: Thames & Hudson. Wardwell, A. 1966. Primitive Art from Africa and Melanesia. Ravinia Festival Art Exhibit 1966. Highland Park. [80 pp. 21 ills. Sales catalogue of objects from 8 New York galleries. Haddon, A.C. 1946. ‘Smoking and Tobacco Pipes in New Guinea’. Phil. Trans. Royal Society of London, Series B., Biol. Sci., No. 586, Vol. 232, pp. 1-278, London. Ronck, Ronn. 1978. ‘Captain Cook’s Treasury of Artificial Curiosities’. Orientations. (Pacific Magazines, Hong Kong.) Vol. 9, No. 7, July, pp. 51-55. Long articles with wide scope, e.g. – Speiser’s survey articles on shields and offensive weapons. – articles on the Oceanic coll’s of particular institutions, e.g. (Treatment esp. the older ones wld be of little value except for how it has increased over the 20th C.
The Book of Art: A Pictorial Encyclopedia of Painting, Drawing, and Sculpture. 1965. New York: Grolier. [10 vols, including one on Chinese and Japanese art – so not purely on Western art. Nothing on tribal art, although it claims, on back of a sort of caver page, to provide ‘a comprehensive survey, in ten volumes, of one of the most creative aspects of human effort’ (stress added)’. Dorra, Henry. 1967 or later. Art in Perspective: A Brief History of Art. New York: Harcourt Brace Jovanovich. 334 pp. 1 of 7 chs on non-Western art, viz. Section 20: African and Pre-Columbian art, Section 21: India, China, Japan. No Oceanic art. Helen Gardner’s Art Through the Ages. 6th edn. Revised by Horst de la Croix & Richard G. Tanser. 1975. New York: Harcourt Bruce Jovanovich. Myers, Bernard S. 1967. Art and Civilization. New York: McGraw-Hill. 440 pp. [Ch 1 of 27 (placed before Ancient art, e.g. Egypt): Prehistoric and Modern Primitives. 9 pp, 8 images on Africa, Americas, Australia, Oceania. Myers, B.S. (ed.) 1969. MacGraw-Hill Dictionary of Art. New York: McGraw-Hill. [6 pp on ?primitive art and one image (Easter I. statues) in 5 large volumes. Stokstad, Marilyn et al. 2002. Art History, 2nd edn. Vol. 2. Ch. 24 Art of Pacific Cultures, 15 pp [Minimal treatment in book of 1200 pp.] Seen at Borders. The Celebrated Rosehill Collection of Prehistorical and Ethnological Objects. The Property of the Late Earl of Northesk. 14-17 July 1924. 709 lots, 32 illustrated. — 1978. Pacific Art. Roseberry, NSW. 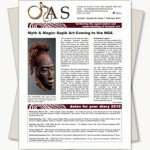 [Auction catalogue of almost 800 items of Oceanic and Aboriginal art; 20 New Guinea pieces illustrated. The George Ortiz Collection of Primitive Works of Art. 29.6.1978. Pacific Resources for Education and Learning. ?2000. Art of the Pacific Islands. An Interactive CD-ROM Collection of Art from Micronesia, Melanesia, and Polynesia. An interactive searchable collection of more than 100 artworks from the Pacific.